Pre amp: Solid State. A 12AX7 tube is listed on the schematic, but this is for a phase inverter. The SE model included a headphone jack and a channel/reverb footswitch The Effect Out, Effect In and Line Out jacks were on the front panel of the SE model only. Absolutely LOVE the sound of this unit! Rich warm tones–highly under rated and under valued. I agree with Swilly. This amp sounds just as good as any tube amp I’ve tried. It also sounds great with an acoustic pickup. It has a lot of low end response. Great amp, I’ll keep it! I tried one at a pawn shop. It was pretty trashed but sounded great. The guy would not budge off $300. I knew that was way to much. Two weeks later Guitar Center had one listed in their used gear section online. It cost me $241 ( with original foot switch) overnighted from NYC to the Colorado high country. This amp compares to my Peavey Delta Blues in terms of tone and ability to take pedals. She came with Chinese tubes that I swapped out for some JJ’s. The clean channel is transparent and smooth. Good clean headroom, although it lacks a little in the low end. The gain channel is a handful, but not completely useless. It has good 80’s Hair Metal tones. I tried this amp with all knobs set at 12 o’clock. It sounded decent and was a good starting point. I will be selling my V-32 combo. Thanks Guitar Center. 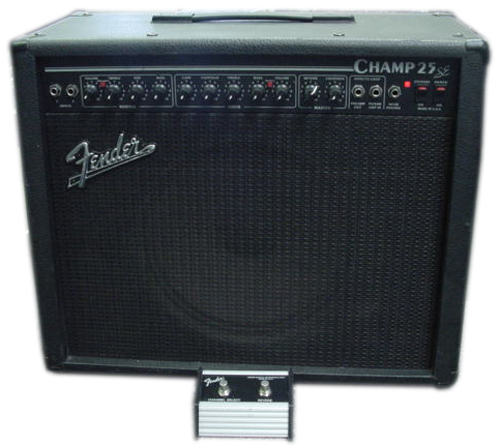 Correction: the effects loop existed (was exactly the same) on both models: Champ 25 and Champ 25 SE. On each amp model the inputs were labelled as “pre-amp out” and “power amp in”. Standby switch and mid-boost existed only on SE model. Several decades ago, I had 70s Fender Twin Reverb with orange JB Lansing speakers. I got ill, long term, stopped playing, couldn’t even lift the beast and so sold it (NOOOOO!!!). A few years later, I recovered enough to play again, on and off, but couldn’t afford to replace the Twin and just wasn’t happy with the sound of any other amp I tried – the Super 60 I tried in a shop sounded good but I couldn’t afford it. Then I got hold of a Champ 25se for not a great deal of money and it absolutely has that warm, sweet chiming quality for which the Twin Reverb is famous! Admittedly, the tonal depth is lacking by comparison, but the Twin is phenomenal in that sense and the Champ 25 is really a beautiful sounding amp, still with at least adequate room for adjustment. Likewise, the swimming pool deep reverb available on the Twin isn’t here but the 25 does still have plenty of good sounding spring reverb for most people’s purposes. The master volume control on the champ 25se does make it possible to get some great grungy Neil Young kind of pure tube distortion, by turning the clean channel volume right up and wheeling down the decibels to a comfortable level using the master knob. The lead channel provides solid state distortion, but then most of us are happy to get overdrive from an effects pedal and I think this sounds good in a Fender kind of way, more than Marshall or Orange. I haven’t used this in a serious gig situation but I’m sure it could cut it in a pub or small club. It’s bulkier than it needs to be for a 1×12″ speaker combo, but it’s a really great sounding and very much underrated amp; here in the UK they sell on Ebay for barely £100 ($130 US??). I don’t think I would sell mine unless someone offered to give me back my old Twin Reverb, and at least I can lift the Champ 25se up into the loft (just!) when it’s in the way – you’d need two strong guys or a hoist to do that with my old amp. Further to my previous contribution: My son is now using the 25se and we can no longer get it to overdrive using the clean channel, strangely. It still sounds great though; gorgeous clean sound! This amp is interesting. There’s one selling locally for $225. Since it has an effects loop, it’s essentially like buying a tube power amp and speaker cab, even if I don’t like the preamp in the amp. I have a mint 25SE that I bought new and have never gigged it. It is all original and may be the best 25SE available. It’s always had its Fender cover on it, has foot switch too. Pristine 25SE…I still have the tags from the music store along with the manual and schematic.